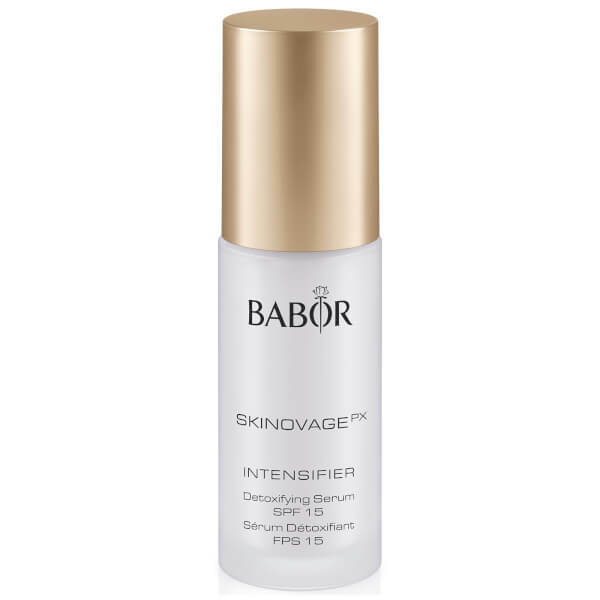 Protect the skin against environmental influences with the BABOR Intensifier Detox Serum SPF 15; a potent treatment that combats the damaging effect of UV rays, environmental and other stressors. Suitable for all skin types. Utilising an O3 Guard, Glucan and UV Filters, the intense serum is ultra-protective and reduces the amount of damage the environment can cause to skin. Complete with Garden Cress extract, the formula strengthens skin’s defence mechanisms, leaving the complexion shielded and healthy looking. 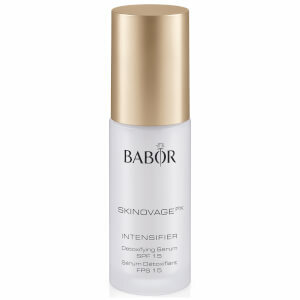 Apply to the face, neck and décolleté each morning and/or evening after BABOR cleansing and allow to take effect. Then apply a treatment cream specific to the skin type. Aqua, Cocoglycerides, Octocrylene, Butyl Methoxydibenzoylmethane, C12-15 Alkyl Benzoate, Ethylhexyl Triazone, Phenylbenzimidazole Sulfonic Acid, Glyceryl Oleate Citrate, Arginine, Cetearyl Ethylhexanoate, Methylene Bis-Benzotriazolyl Tetramethylbutylphenol (Nano), Tocopheryl Acetate, Aloe Barbadensis Leaf Juice, Panthenol, Glycerin, Phenoxyethanol, Caprylic/Capric Triglyceride, Isopropyl Myristate, Acrylates/C10-30 Alkyl Acrylate Crosspolymer, Limonene, Decyl Glucoside, Potassium Sorbate, Saccharomyces Ferment Lysate Filtrate , Parfum, Ethylhexylglycerin, Disodium Edta, Lecithin, Sodium Carboxymethyl Betaglucan, Linalool, Propylene Glycol, Pantolactone, Lepidium Sativum Sprout Extract, Xanthan Gum, Citric Acid, Citral, Sodium Benzoate.